One entry per person only during the Promotion Period. There are twenty (20) prizes. 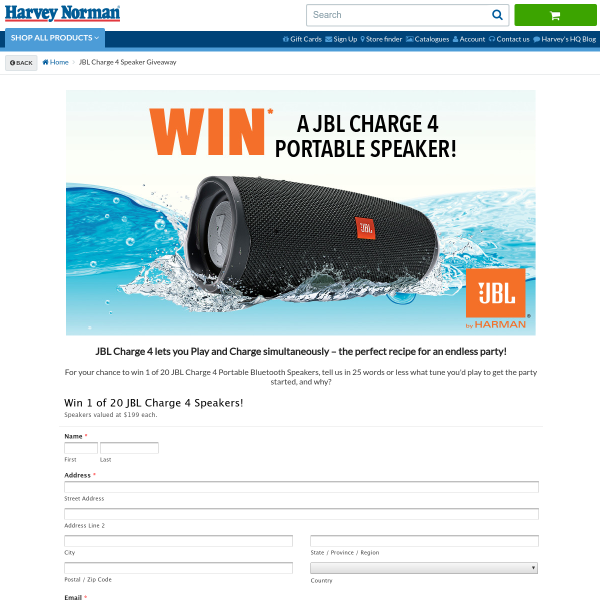 Each prize is one (1) JBL Charge 4 Speaker valued at $199 (“the Prize”). Judging for the Prize will take place at Harvey Norman Corporate Office, 21aRichmond Road, Homebush West NSW 2141 on Tuesday, 1st May 2019 at 2pm (“Judging”). Judging will be based on the best answers given. Winners will be notified by phone within two (2) working days of the Draw (“Winners”). Winners will be notified in writing within five (5) working days of the Draw. The Promoter reserves the right to request Winners provide suitable identification of proof of age and identity prior to awarding a Prize. If a Winner is under 18 years old, the Prize will be awarded to the Winner’s parent or guardian. Winners details will be published online at www.harveynorman.com.au/winnerannouncements on Friday, 3rd May 2019. The Promoter reserves the right to announce and/or publish the Winners name and/or photograph for publicity purposes. Judging for any unclaimed prizes will take place at Harvey Norman Corporate Office, 21aRichmond Road, Homebush West NSW 2141 on Wednesday, 7th August 2019 at 2pm. Winners of the unclaimed prize will be notified by phone and in writing within ten (10) working days of judging. Entries that are illegible, incomplete or do not comply with these Terms are invalid. The Promoter reserves the right to verify entries and claims for Prizes and reserves the right to disqualify an entrant where the entry process has been tampered with.